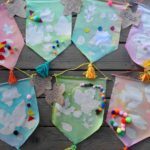 Nature crafts are great to encourage children to go outside and engage their senses. 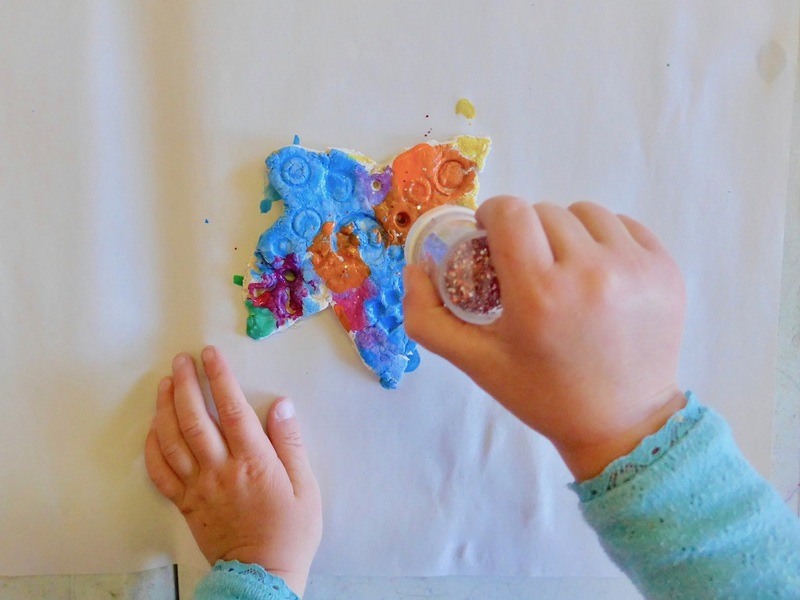 As we go on nature walks we observe the changing seasons and collect little treasures: Colorful leaves, pinecones, rocks – anything with beautiful colors, interesting shapes and patterns. 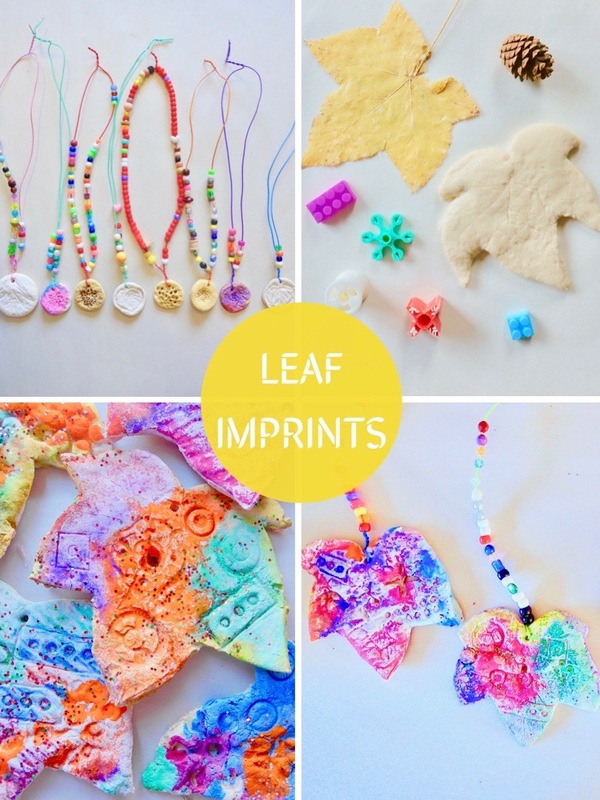 Since the children were especially interested in investigating leaf veins and have been playing with playdough, we decided to extend this exploration by making nature necklaces and leaf imprints from some of our nature treasures. 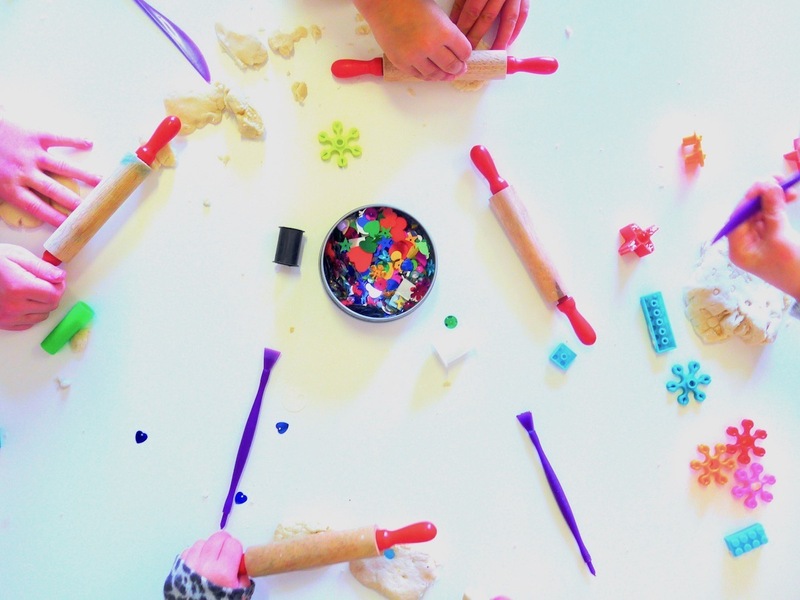 Toddlers love working independently as they discover their own autonomy. 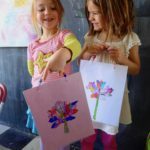 They love doing things by themselves and we can help them by providing the right set up and materials they can choose from and are able to handle without major help from you. 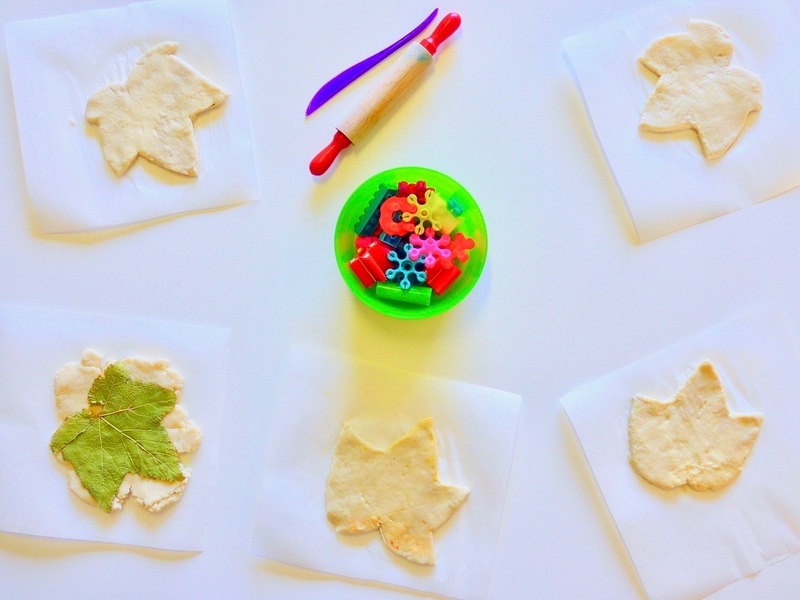 To make leaf imprints set out a fist sized amount of salt dough on wax paper sheets, one for each child. 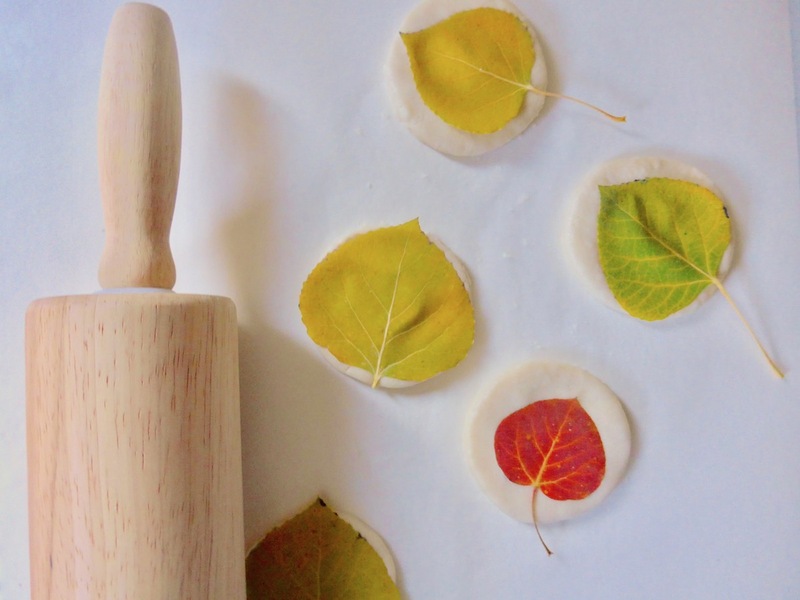 Also place some fall leaves, dull knifes, small rolling pins and some more wax paper sheets on the table. 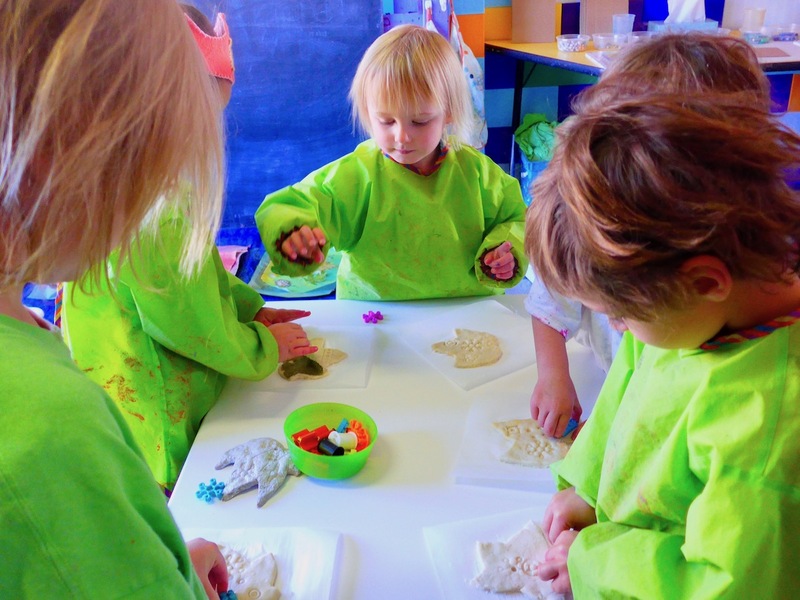 Show the children how to roll a ball and how to press the dough flat with the palm of their hands. 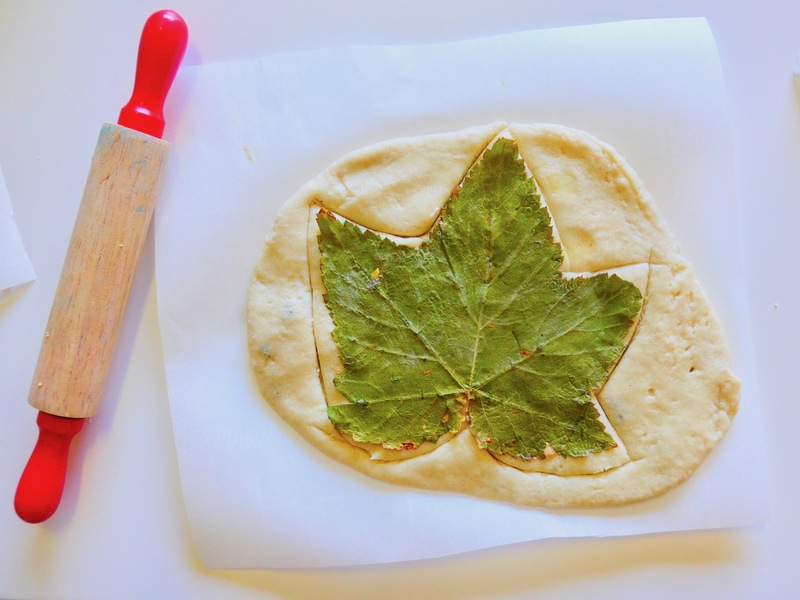 Place a leaf on top of your dough (veiny side down), cover with a precut wax paper sheet and roll your rolling pin over it to create the leaf imprint. 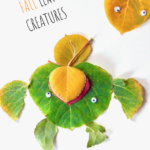 Carefully cut around the leaf shape and lift up the leaf. 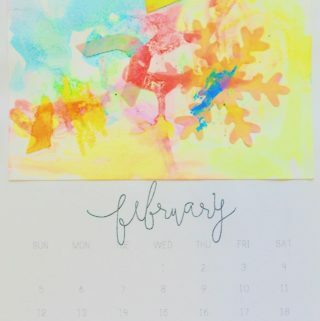 Reveal your print which is going prompt a lot of “Ahhhs” and “Ohhhs” from the children. Repeat as often as you like and put the finished leaves on a baking tray. 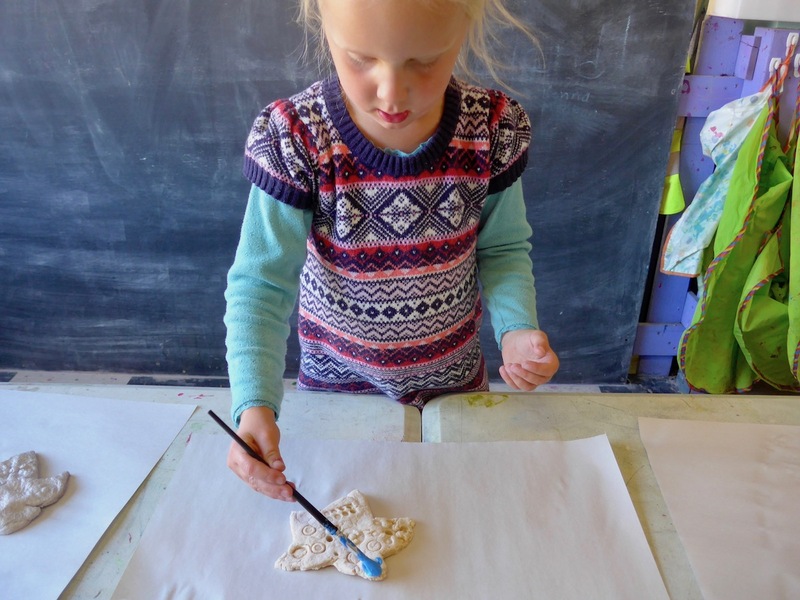 Since we used salt dough instead of air dry clay, our imprints didn’t quite show every leaf detail. 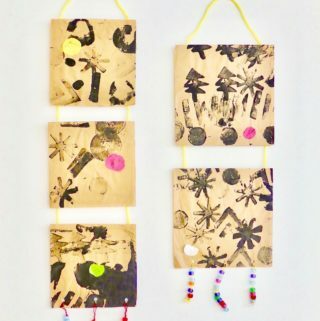 We experimented some more by adding imprints with various loose parts which the children collected from our toys and art bins. 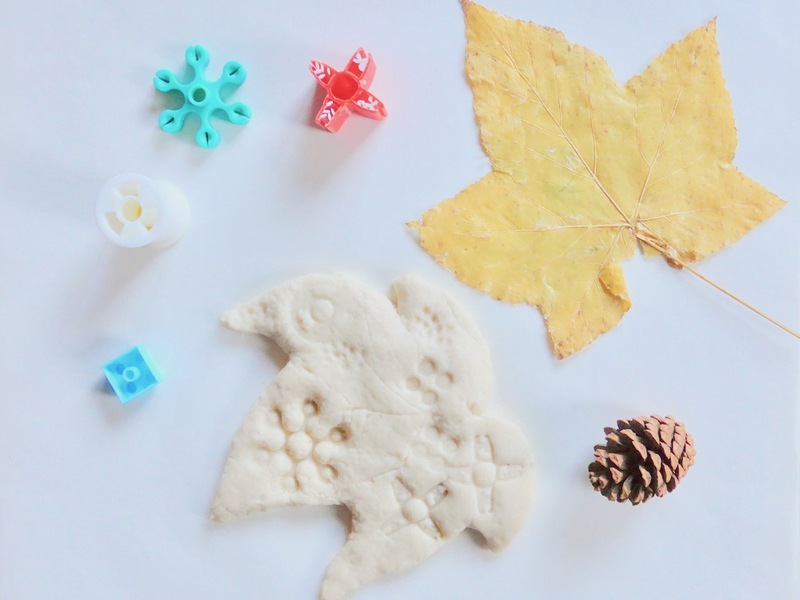 They looked for anything small that might create a interesting imprint and found things such as lego’s, marker caps, pinecones, yarn spools and other random loose parts. Don’t forget to push a hole through the top of your leaves (we used a straw) to attach a hanger later. 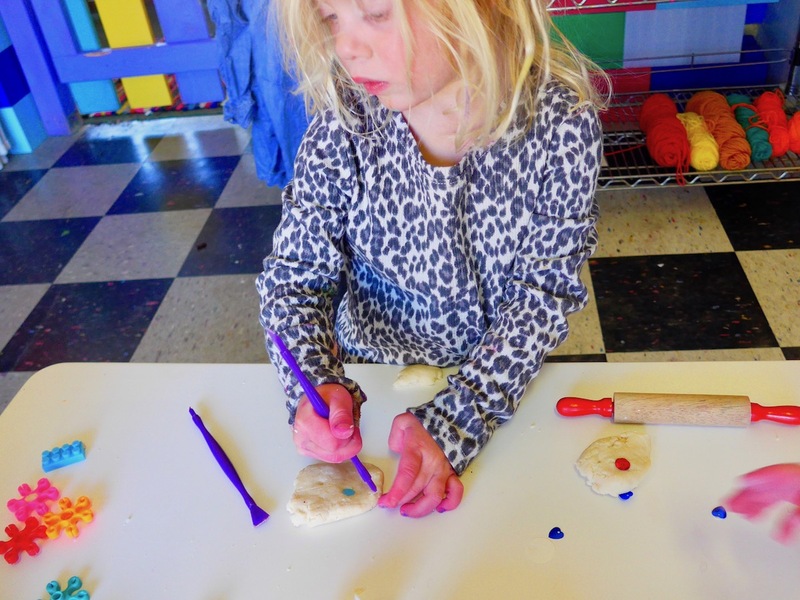 Keep in mind that the children likely want to play and explore freely with the salt dough. 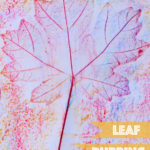 The children seemed interested in and had fun creating a leaf imprint but if a child would have shown more interest in just playing with the salt dough right from the start I wouldn’t have forced them to make a leaf imprint. 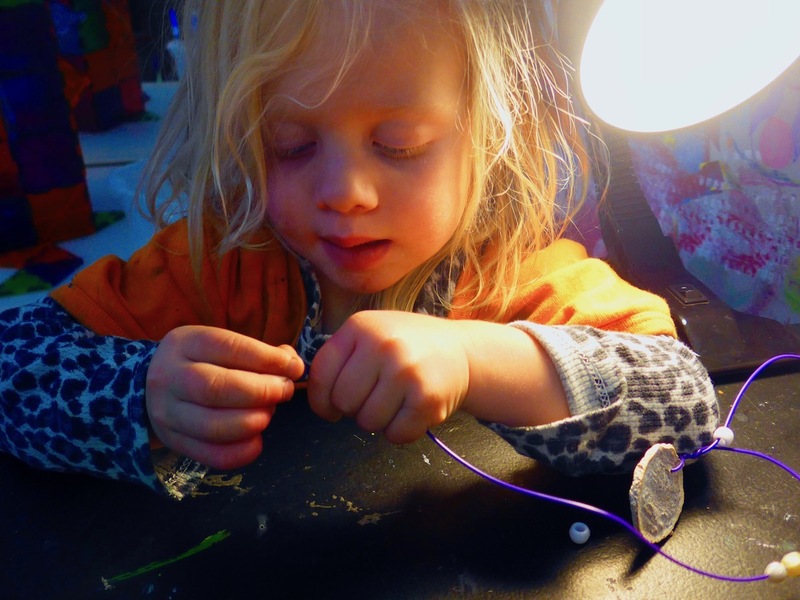 All objects are open for exploration and the possibilities of creating and learning are limitless. 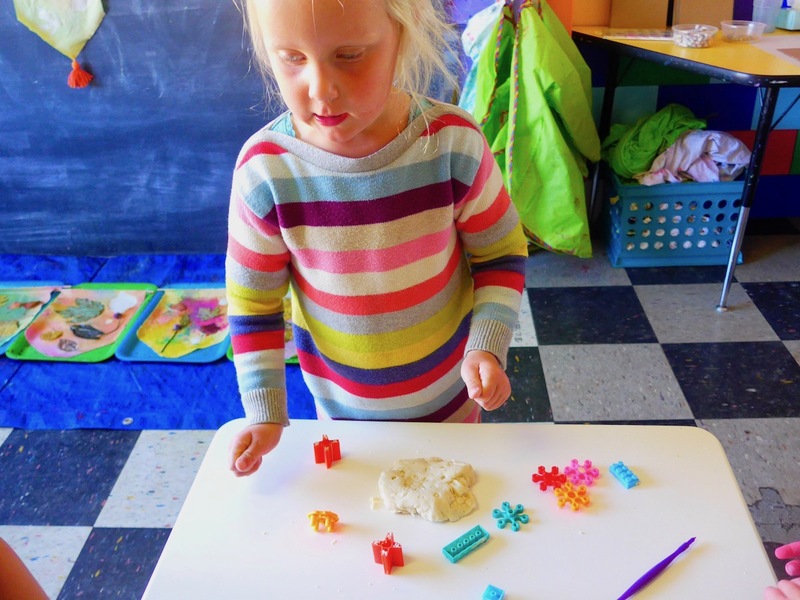 Joyful, “open ended” play with salt dough, loose parts (lego’s, leaves, pinecones etc.) and clay shaping tools might just be enough to explore in it’s own. 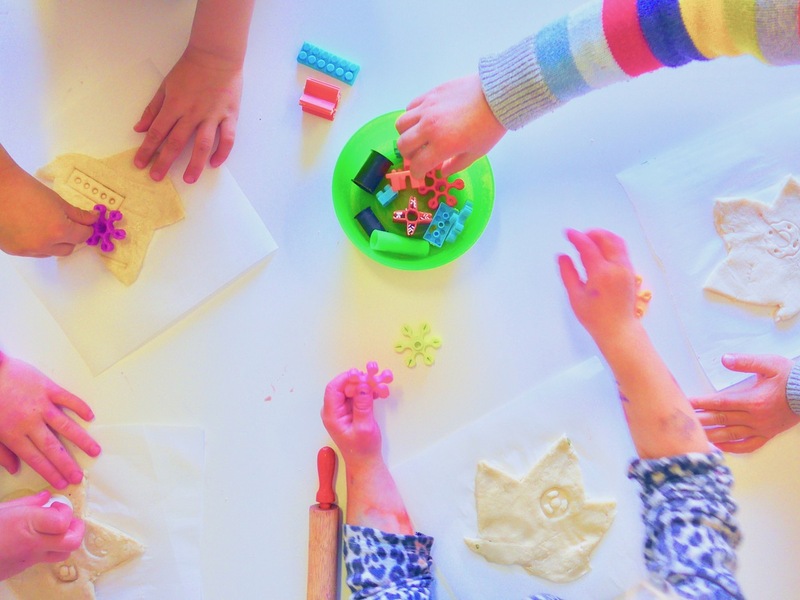 The children especially liked manipulating the dough with the knifes, opened ‘pretend’ bakeries, asked for sequins to decorate their cookies and started counting and sharing them which each other which kept them happy and engaged for a very long time. 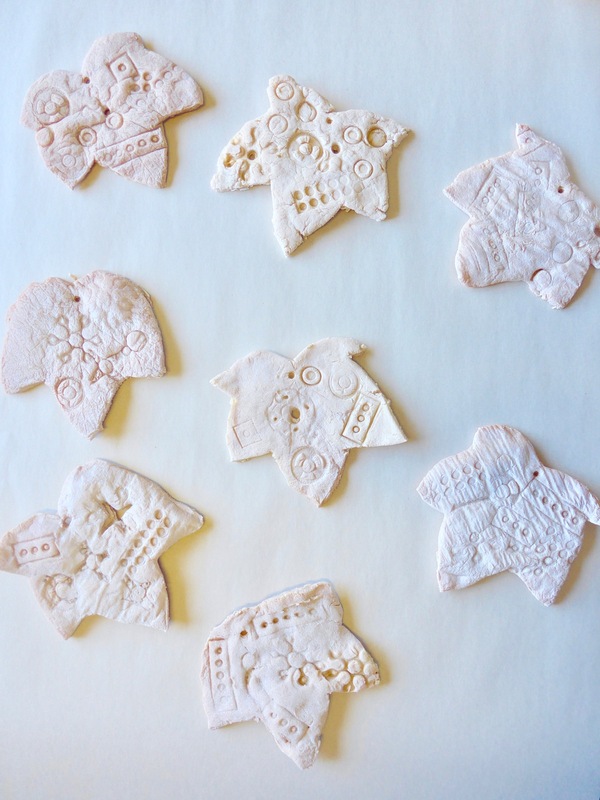 Bake your salt dough leaves at 200 degrees F. We left ours in the oven for about an hour until theleaves hardened. 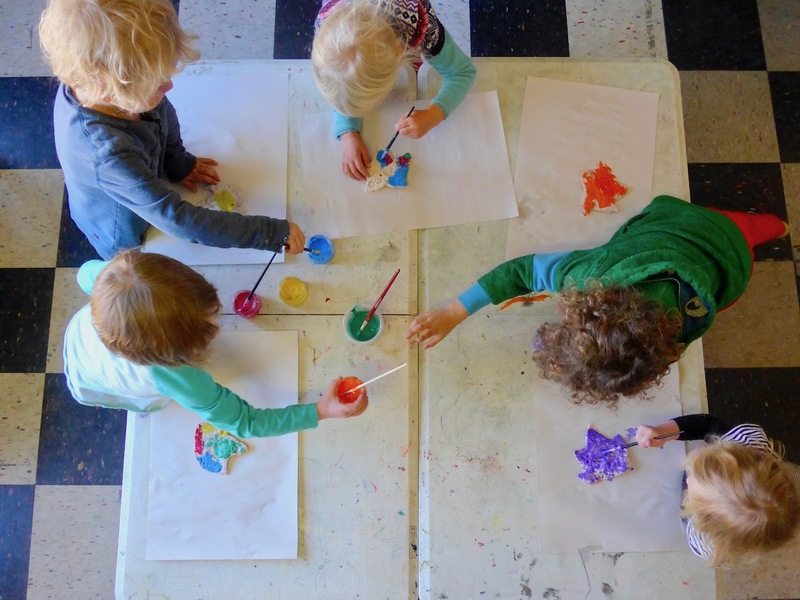 Set out cups of paint, put a paintbrush in each color and let the children take one color at a time. 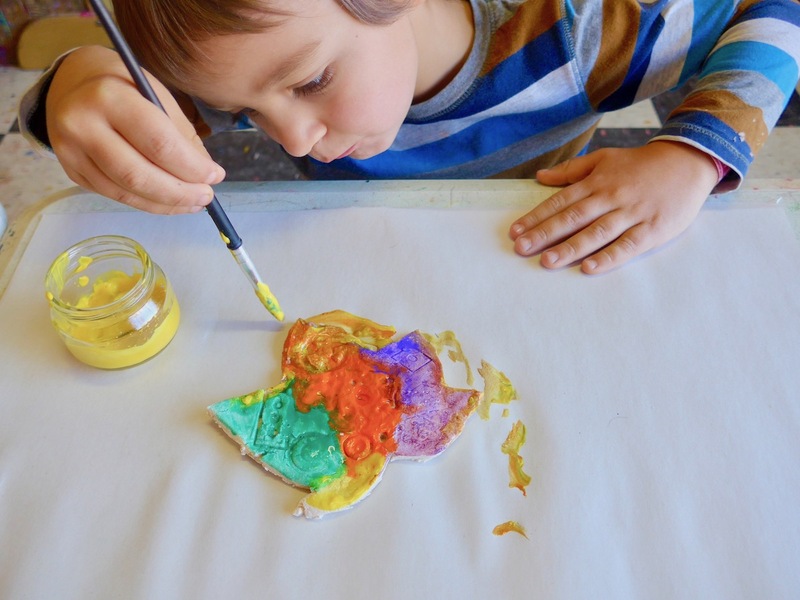 Remind them to put the paintbrush back in it’s color. This is a perfect opportunity to practice sharing and asking each other for turns. 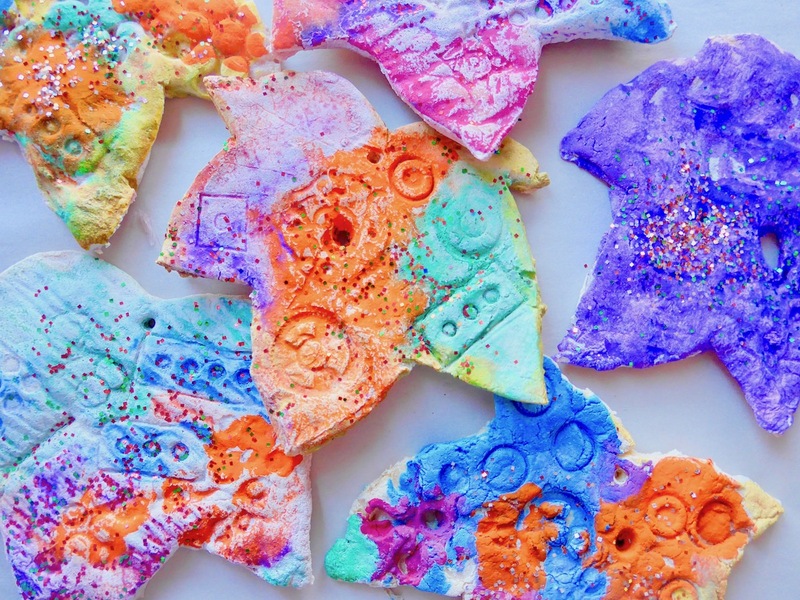 We also used glitter shakers because everything is better with glitter? 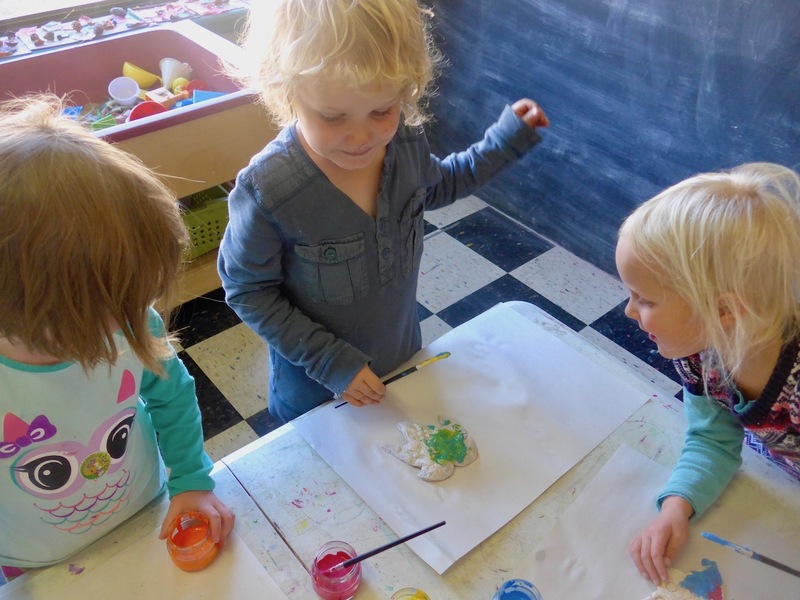 The children love shaking glitter on wet paint! 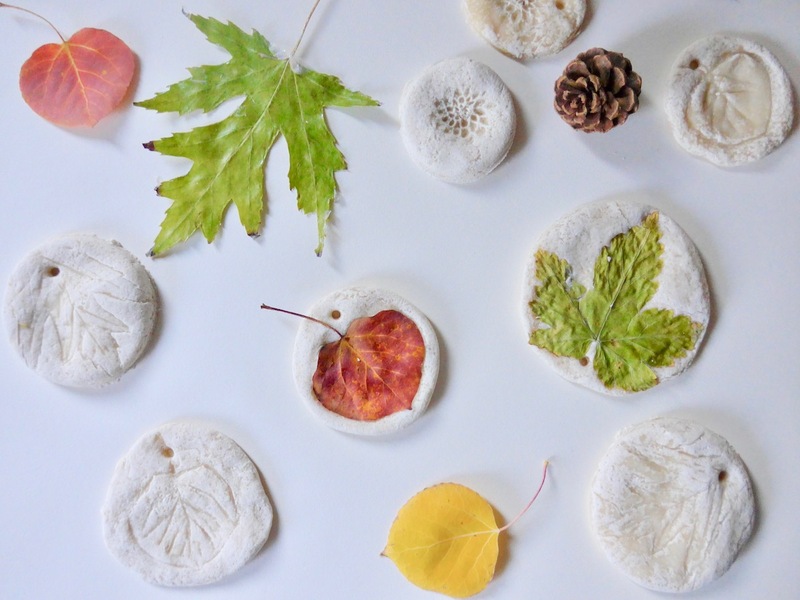 You can also add a layer of Modge Podge when the leaves are dry which will seal them for forever. We were so busy with other projects that we actually forgot about our leaves until Thanksgiving. 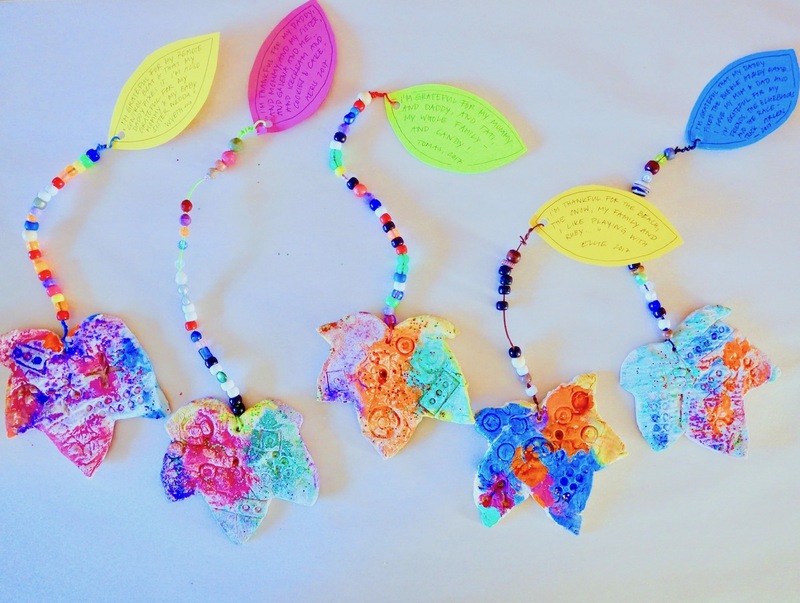 We added beaded hangers and attached a note for what each child is thankful for. 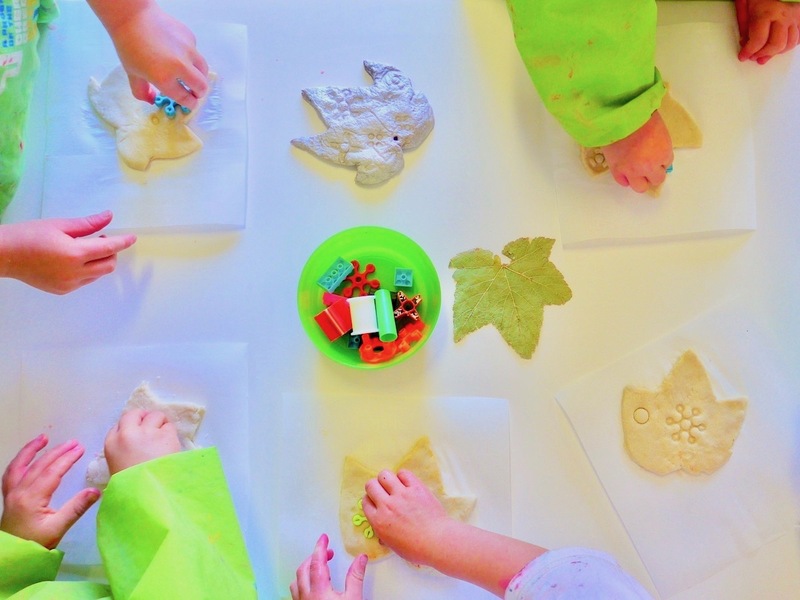 While some children were still playing with the salt dough others asked if they can make more leaf imprints. 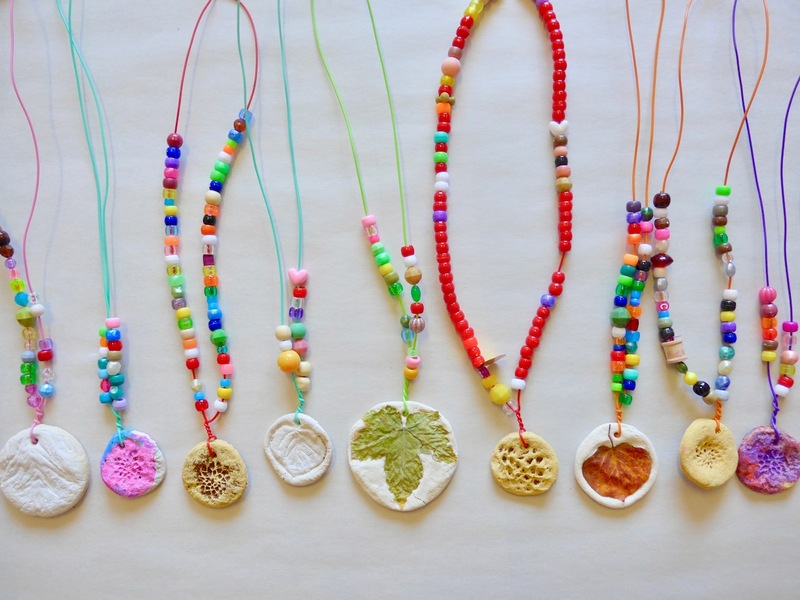 Since we didn’t have much salt dough left, we used small Aspen leaves and smaller amounts of salt dough for little imprints which ended up lending themselves perfectly for making necklaces or keychains once they baked and hardened. 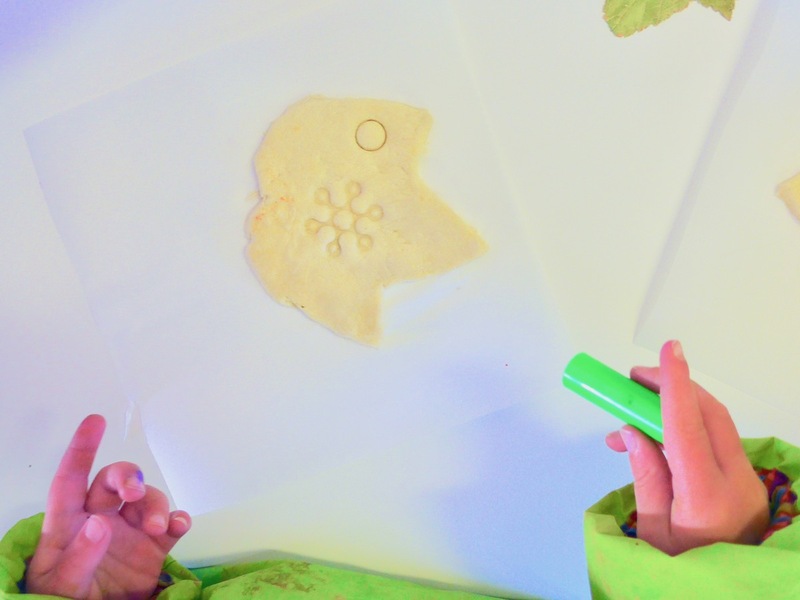 The children already knew the process of making imprints, flattened the salt dough balls, put a leaf on top and simply pressed it in with the palm of their hands. 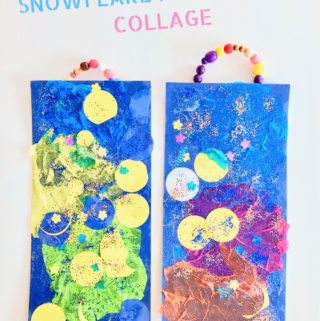 We also used pinecones. Don’t forget to push a hole in the top (we used a straw) so you can attach a hanger later. 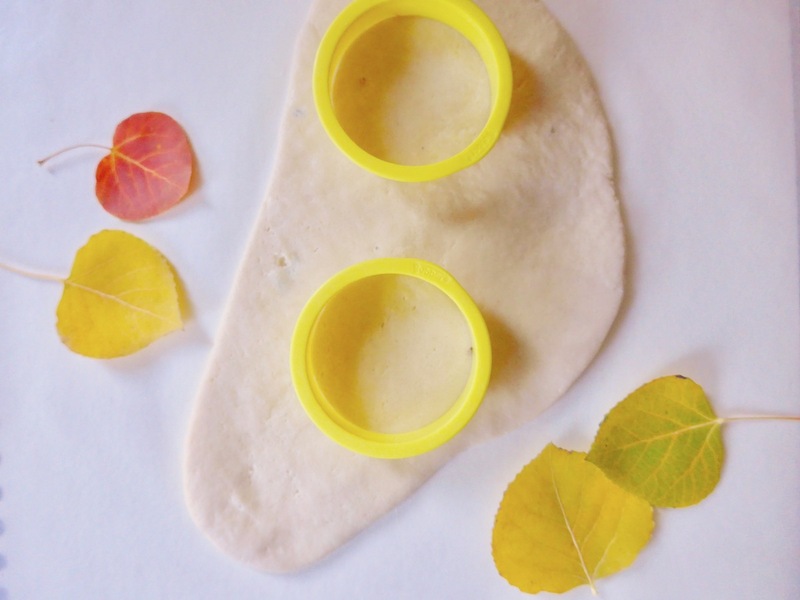 In some cases the leaf got stuck in the sticky dough. 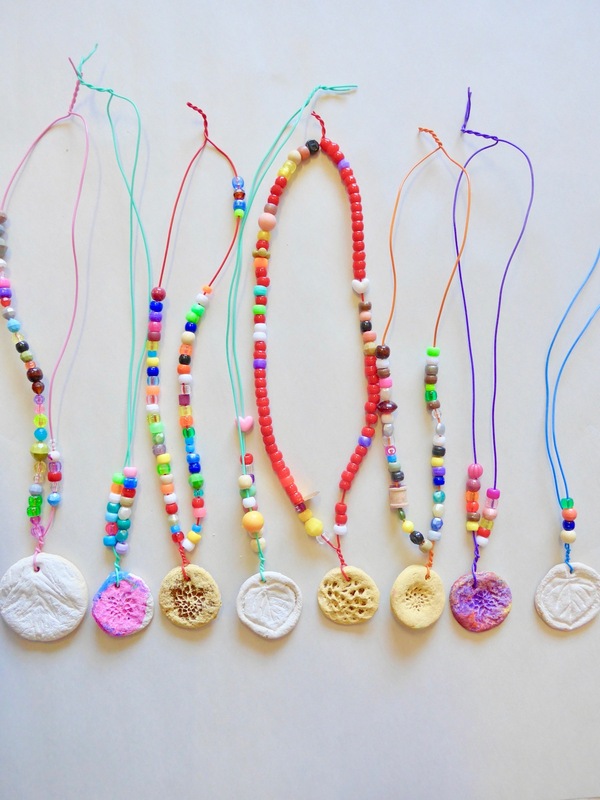 We just left those, the dough hardened and we could still use them for necklaces. 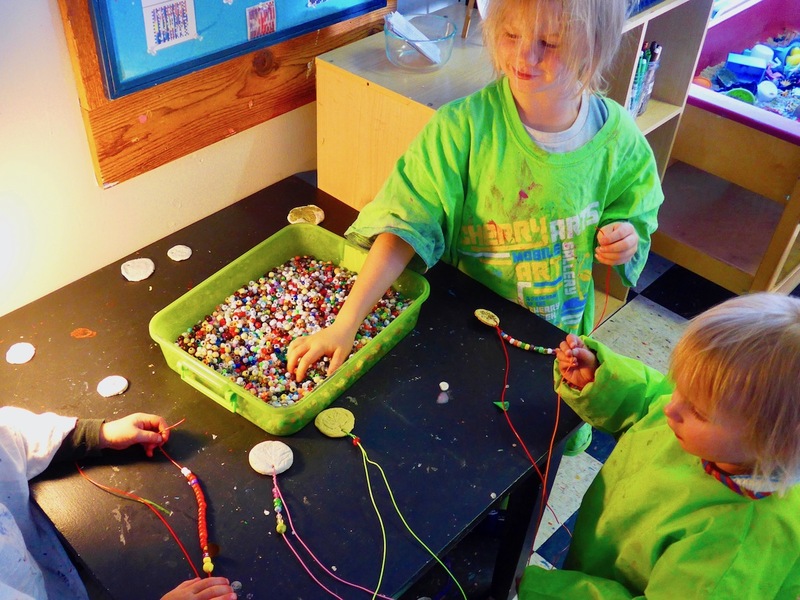 Some children decided to paint their necklaces.